Jade has had a hard time living her life ever since she started getting panic attacks. The only thing that helps her stay calm is watching the elephants at the nearby zoo. She watches them from her bedroom on the webcam the zoo has installed, and that's where she first notices Sebastian. Jade watches for him and the baby he carries every day, curious. But when she meets him face to face months later, Jade begins to fall for him. She doesn't tell her parents, who are too preoccupied avoiding each other to notice her love life. She's afraid of what they might think about Sebastian being a teenage father, but for the first time in her life, she starts living without fear and worry. Things with Sebastian aren't simple or conventional, but they're right. But Sebastian is hiding a big secret, one that forces Jade to really decide what's right and what's wrong, and could threaten ruin everything. The Nature of Jade is a thoughtful, sweet, and romantic novel with some very unique elements that will pull you right in. Jade is a very engaging and lively narrator that many readers will like immediately. She struggles with her anxiety disorder, but she refuses to let it define her or control who she wants to become. She fights it by finding what she's passionate about--caring for the elephants--and she gets involved. Her family is dysfunctional, but she deals with them the best she can, and her precocious little brother provides lots of comic relief. Sebastian and his little boy can't appear enough in this book. He's everything a girl could wish for in a guy, but he's not perfect either. Their romance is sweet, but not uncomplicated and he and Jade work well together. However, this book's main emphasis is on the importance of family and doing what's right, which Jade struggles with. Her journey has a lot of pain and hardship in it, but also a lot of hope and happiness, and readers will appreciate the fact that Caletti keeps this book realistic. 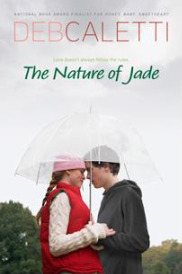 The Nature of Jade is a one of a kind book--incisive, funny, real, and full of emotion. Cover Comments: The cover shown isn't the original one, but I like this one best. It conveys a lot of emotion, and I think it's just so sweet. I love the smile on the girl's face, and how the sky is a bit cloudy. It's perfect. I've been meaning to read The Nature of Jade for forever. I've been hearing nothing but good things about it. Glad you liked it! I'll keep on eye out for this one. I am new to Deb Caletti's books. I absolutely love this book. So glad you liked it! It really is a one of a kind book. I read it years ago and it still makes my heart pitterpatter. I do like this cover more than the original! This is my fave Caletti book!! love love love it! This book sounds great! I will look for it immediately! Thanks for the heads-up on this title! It sounds excellent.